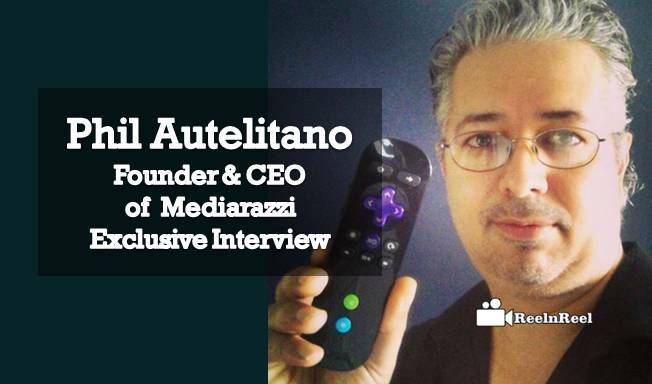 Reelnreel.com Exclusive Interview with Phil Autelitano – Founder & CEO of Mediarazzi a leading Connected TV Developer. Tell us something about Mediarazzi? Tell us about Mediarazzi’s Services? What are Video Advertising Trends? What are Mediarazzi best practices? Tell us something about your Streaming media services and New streaming channels? What are the Latest workshops you have done that can help brands? How can Upcoming Brands benefit by using your Mediarazzi? Mediarazzi develops and produces TV channels and applications for OTT/Connected TV platforms including Roku, Amazon Fire TV, Apple TV and Opera (which includes LG TVs, Sony and Samsung TVs and Blu-Ray, TiVo and others). by that I mean we’re more than just a developer, for some clients and partners we also manage channel operations, including advertising and ad sales, content acquisition and even content production in some cases. We play a key role in the growth of the channels we develop and manage. We’ve also grown to acquire and distribute content to other platforms like Netflix, Hulu, Crackle, and Amazon. Our primary business is content distribution and monetization. Though we are essentially a “developer” our business has grown from merely providing development to a broad range of content distribution and monetisation services. It’s no longer just about creating channels, it’s about maximising the content for all it’s worth. Since we started in 2012, we have discovered — or pioneered — several new monetisation solutions for Roku and Connected TV channels. For instance, I was the first one to introduce “per inquiry” and “performance-based” advertising to Roku and Connected TV platforms. This monetisation also serves as the basis for a new ad network we recently launched called AdNext. (www.adnexxt.com) — it’s like the Google Adwords of Roku and Connected TV, offering streaming and performance-based monetisation among other things. Right now the biggest trend is streaming advertising, and I expect that to continue to grow as more publisher discover Roku and Connected TV platforms. Streaming ads are paying $/CPMs — anywhere from $5 to $12CPM on average. I expect that to grow as well, as these platforms reach critical mass, with the CPMs more in-line with traditional TV advertising CPMS, which are double to three times that now, on average. Speaking of critical mass, one trend to watch for will be the mass exodus of content creators from YouTube to Roku and Connected TV platforms. As the technology grows and more and more YouTubers discover there are higher CPMs to be earned on these platforms, in addition to having more control over their monetisation options. Of course, it will take some time for Roku and Connected TV to catch up on YouTube. But, I think if you look at the numbers from where it was to where it is now, I think you’ll see it’s growing at a faster pace. It’s only a matter of time. First and foremost, Mediarazzi is committed to growing Roku and Connected TV viewership. Without the viewers, the platform is useless to us, our clients, our partners, and our advertisers. We spend as much time getting the word out about Roku as we do promote our services to potential clients and channel partners. I see it all as the World Wide Web all over again — but on the big screen — I tell everyone “channels are the new websites”. and with that second chance I think there comes a responsibility to do it right. That is, to focus on quality and using this amazing new technology to educate, entertain and hopefully make the world a better place. I think the Web in many respects got away from us. With Connected TV we can learn from those mistakes and just …do it better this time. We have launched dozens of channels over the past few years. In 2014, after Paula Deen got kicked off TV, I’m the guy who brought her back, via Roku, to the delight of her millions of fans. When boxing legend Oscar de la Hoya wanted to launch a channel, he read something I wrote somewhere, and they called me. We’ve launched channels for other brands like Westgate Resorts, Optima Batteries, and even L.A.’s notorious rock-n-roll club, the Whisky a Go Go. Right now we’re working with several major brands and household names — from Tesla to Dolly Parton — to create Roku and Connected TV presences for them as well. For many brands, the idea of having their TV channel is now as much a no-brainer as having a website. Lately I’ve been running hands-on workshops to teach entrepreneurs, content creators, studios, filmmakers, brand managers, agencies and others how to develop and launch their own Roku and Connected Television channels quickly and cost-effectively. When I say “workshop” I mean it’s an actual, labour-intensive program, more like a hackathon. I don’t just talk. I teach hands-on, and workshop attendees leave with a new skill and a finished, working product — their TV channel that’s working for them 24/7 to build and grow their brand, and in many cases already earning them money before they get home. This is actually my favorite question to answer. I like to tell the story of how 20 years ago, my business was web development, not “TV channel” development. I remember sitting across the desk from the then-CEO of a Fortune 100 company trying to explain to him WHY his company needed one of those new-fangled things called a “website.” His response, “Why the hell would our company ever need a website? Our customers are NORMAL people…” It was another five or six years before his company finally did get a website and by then, they were way behind their competitors. Fast forward 20 years, and I’m sitting in front of the same guy, now CMO at another Fortune 100 company. His response this time? “I regret not listening to you the first time. I should have done some research. This time I have, and without a doubt, a TV channel is the best thing we can do for our brand right now.” Funny how times change. For both new and established brands, a Roku and Connected TV presence means engaging their audience — their target market — in ways that are more captivating and compelling than just a website. Only recently have brands begun to understand the value of video content in growing and building loyalty. Through the 90s and 00s, websites gave customers something more to look at than just a product label and a TV commercial. Websites gave them INFORMATION. Websites pulled them in and engaged them, made them feel like part of the family. People joined lists, played games, were entertained, etc., and websites proved themselves a valuable tool in brand-building. Today a website is a given. At the same time, attention spans have gotten shorter and shorter. People don’t want to read what they can watch. This is why video content is becoming so popular. It’s fast, and in many cases even more entertaining — whether funny, interesting, amazing or compelling. I like to call it “Brandvertainment,” — a growing movement of branded content designed to entertain and/or educate while building brand awareness and loyalty. And with more and more eyeballs returning to the TV set for their entertainment now, it only makes sense to move that Brandvertainment from the Web to the TV screen. Or at least to be in both places. Bottom line, a Roku and Connected TV presence offers brands increased opportunities to engage customers and create new ones, to build awareness and loyalty, to reach viewers they’re not necessarily reaching online or through other media. Brands can quickly and easily reach as many viewers, if not more, than they would with traditional television advertising, Internet advertising, and web presence, and at a fraction of the cost. The barrier to entry is low. And for brands that are already producing video content for the Web, it’s a great way to maximize the content they’re already producing at no additional cost. Roku and Connected TV channels can be developed and deployed in just 2 to 3 days, and because Roku and Connected TV platforms are still in their infancy, and their viewers are STARVED for content, brands can reach millions of viewers nationwide, and millions more worldwide, quickly and almost effortlessly. Again, going back to the birth of the Web comparison, Roku and Connected TV platforms are a virtual land grab for new channels — and brands — just like the Web was 20 years ago. To know more about Mediarazzi visit www.mediarazzi.com . Thank You Phil Autelitano for sharing your valuable inputs for Reelnreel readers.